As we cross the Gulf Stream from Miami to Bimini, and eventually lose all connectivity (wi-fi, local mobile networks, hotspots, etc. ), now is a good time to explain how I will blog from the middle of nowhere, ocean. It's actually quite simple. I have a laptop and a satellite phone (pictured). 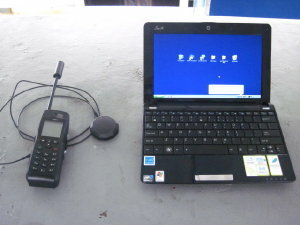 The sat phone is turned on and using GPS satellites and a USB cord to connect it to the laptop, "wa-la" I have connectivity. Well, it may not be as simple as I make it sound, but the concept is, and with luck (and user skill) I will be able to post while at sea. Success if you are reading this!